The Powerstation AC was announced on Wednesday, and contains an inverter, and can provide 100W of power through a conventional AC plug, allowing for higher-drain devices to be run or charged through the battery with their own power adapters. The USB-A, USB-C and AC plugs are available concurrently, with up to 100W of charging happening simultaneously. A single USB-C port provides 30W of power to a connected device, suitable for the fastest possible charging of Apple's 12-inch MacBook. 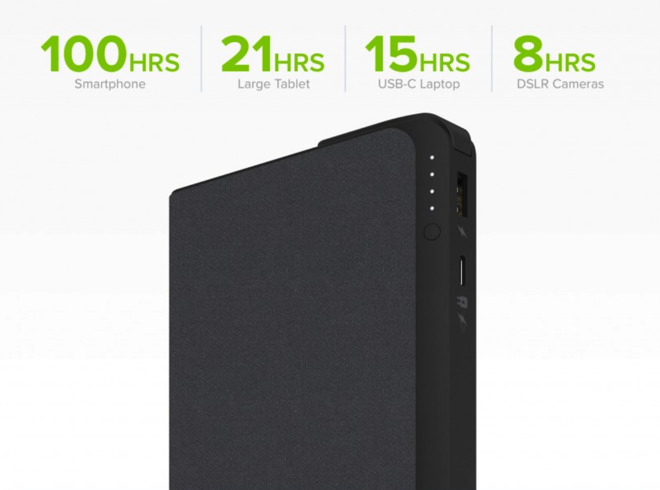 The battery in the device is 22,000 mAh, with Mophie claiming that the Powerstation AC can deliver 15 hours of extra battery life for the MacBook, and one extra hour to a MacBook Pro connected to the AC plug on the battery. The Mophie Powerstation AC will still charge the 60W 13-inch and 87W 15-inch MacBook Pro while the computer is off through USB-C, but will not maintain full power while either laptop is actively being used. It can also be charged by USB-C when connected to a computer connected to another source of power with a button-press. A "Priority+ Charging" feature provides pass-through power to a device connected to USB-A before the battery in the unit charges. Charging of the battery itself is performed through USB-C. The Mophie Powerstation AC is available now for $199.95. It includes a protective cover for the device and a charging adapter, but charging cables like USB-C to USB-C or any USB-A cables are not included.